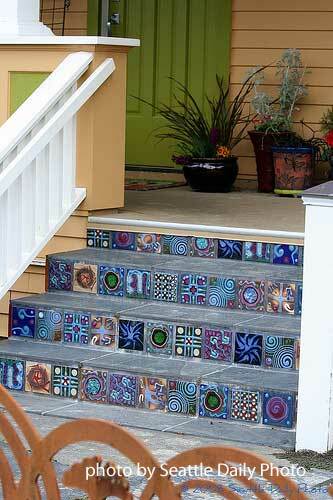 Concrete porch steps - paint 'em, stamp 'em, stain 'em, add texture, tile, or add aggregate. 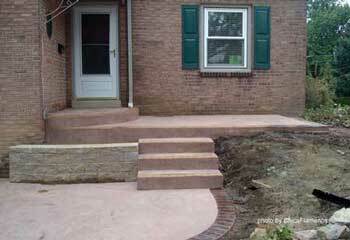 Versatile and almost maintenance free, concrete steps are the perfect option for many front porches. 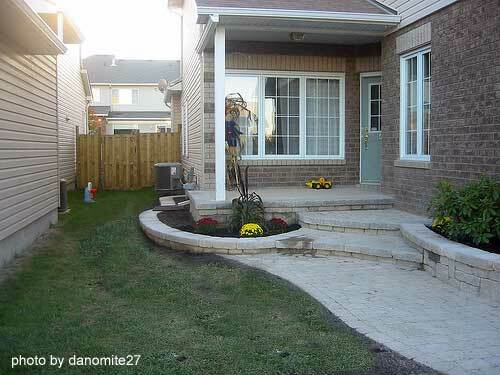 There's more to concrete steps than meets the eye. Built properly, they should last many years. 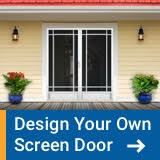 We'll show you how they are made and what you can do to enhance their appearance. As you can easily see in the photos above, concrete can be used to not only create curb appeal but also add functional space as well. Concrete steps don't have to be boring; the concrete steps above are covered with tile and slate making for a beautiful presentation. For small jobs you can often mix and pour the concrete yourself. For larger projects, you will need to have it delivered. Either way, you'll need to start with the forms. Building a small set of steps (2-3) is fairly easy for the average Do-It-Yourselfer; however, for anything larger I highly recommend you hire a professional. Please notice the board running down the center of the steps. This board ensures the steps do not bow out when the concrete is poured). The key to proper forms is calculating the rise and run. The rise (or height of your steps) and run (the depth of your steps) depends on the total length of your steps. The higher the rise the less steps you will need. However, the higher the rise the harder it is to climb the stairs. 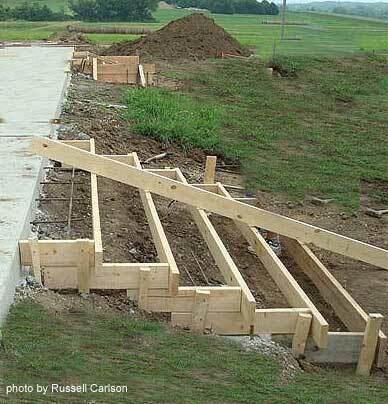 Once that is done, it is only a matter of positioning boards based on the rise and run to create the actual form for the concrete porch steps (as shown above). 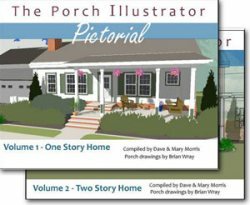 We've made it easy to understand and calculate the rise and run for your porch steps. 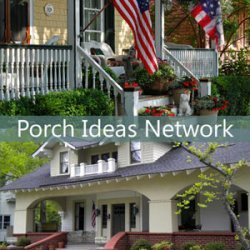 Although we show calculating the porch roof rise and run, the process is the same for steps. 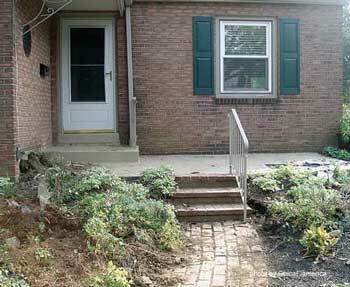 Although I've seen porch steps built (or poured) right on the ground, I am a firm believer in preparing the base. The colder the climate, the better the base you should have. 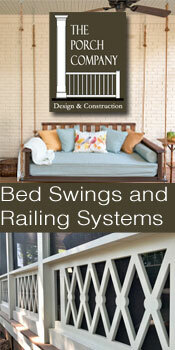 Check with your local building codes department for specific requirements for your area. Begin by leveling the area upon which you will build the steps. I like to dig out 4-6 inches and fill it with stone dust (or sand/gravel). Compact it well. 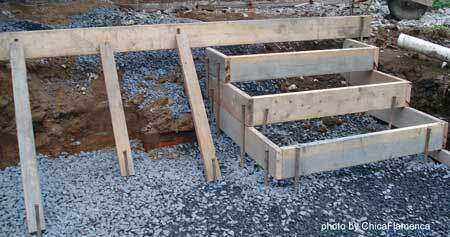 The idea is to ensure adequate drainage and to prevent the steps from lifting due to ice in winter. In other words, prepare it like you would for a foundation. 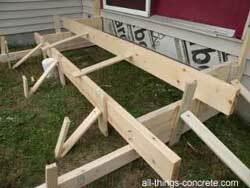 You can use 2x4, 2x6, 2x8, or plywood to build the form. Cut the wood to the dimensions of your steps based on your rise and run calculations. 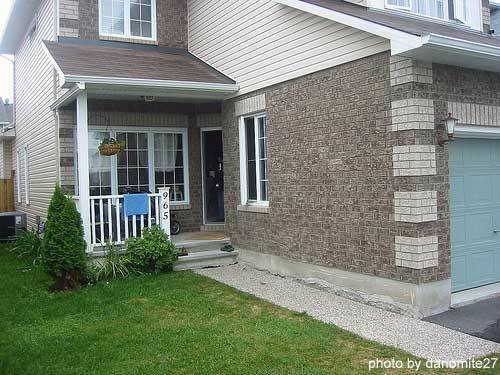 Note: you will need to adjust the sides for slope at a recommended 1/4 to 1/2" per foot away from your house. Brace the form so it will remain in place as concrete is poured. The more bracing you have the better; it is very difficult to make adjustments when concrete is pouring into your form. It is way better to have more bracing than necessary rather than have your form come apart during the pouring process. Make sure your form remains level and perfectly vertical. 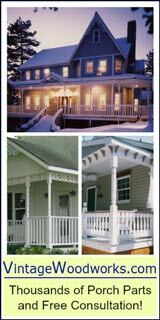 If the steps are to be attached to the porch or home, ensure you install rebar so as to prevent the steps from separating. Often times I've seen builders coat the inside of the form with grease to make it easier to separate when it dries. However, I prefer form liners like those in the video below. The following video explains the use of liners for your concrete porch steps, pouring, removing air pockets, and finishing the concrete. It may be well worth your time to see it. Depending on the height of your concrete porch steps, you may want to use fill such as gravel, broken bricks, broken concrete blocks, etc., to reduce the amount of concrete. Just make sure you mix the concrete around the fill thoroughly. Also, make sure the fill is not close to any edge. Add rebar or wire to help hold the concrete together. When pouring concrete porch steps, overfill the cavities just a bit. This will give you a sufficient amount for settling. Work it in with trowels and shovels. Also, pour the entire set of steps at one time. Screed the forms immediately. Screeding levels the concrete (photo below) by removing the excess. I usually use a length of 2x4. 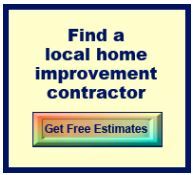 Depending on the length of your steps you may need a person on each end of the 2x4. Use a float to smooth any rough spots and to get the edges. Once the concrete has turned to a dull grey, round the edges with an edging trowel. This will keep the edges from breaking off and will be more pleasing to the eye. Use overlapping strokes of a trowel to get it perfectly smooth. For steps; however, I recommend you use a wood trowel or even a broom to give the surface a textured look and keep it from being slippery. Allow it to cure for at least 24 hours before you "gently" remove the forms. You don't have to stop there. 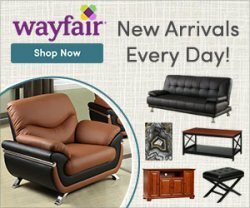 Now that you have a new set of steps check out these neat options. 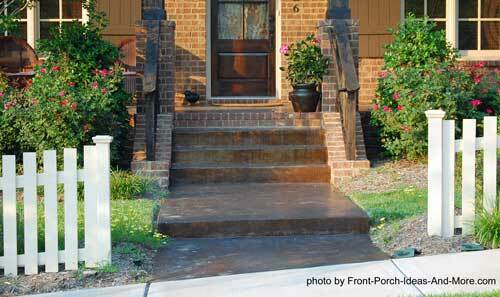 Concrete staining is an easy way to change the appearance of your porch steps. 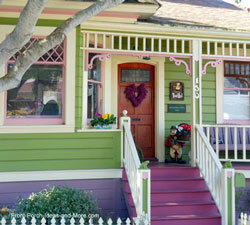 You can stain them in a variety of colors to complement your home. Concrete stamping is yet another option. 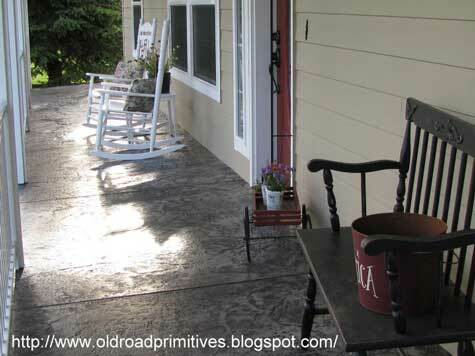 Kim's concrete stamped porch is wonderful. 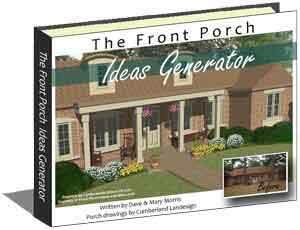 Stop by to see more pictures of her concrete porch floor.